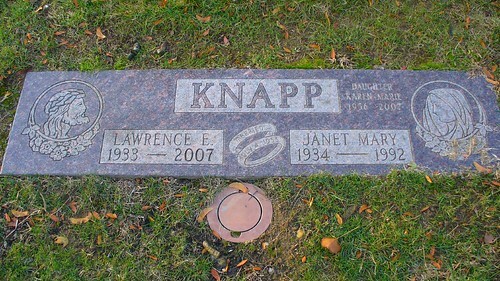 Some of you from St. Blog's might remember Karen Marie Knapp who blogged at From the Anchor Hold. Karen lived in Milwaukee but on a visit to her family in Akron, she suddenly passed away in the summer of 2007. Coincidentally, she is buried in the same cemetery as my baby and my father. 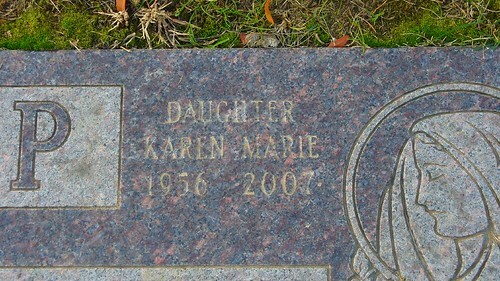 I had visited Karen's grave shortly after her death, but there was no permanent marking. Earlier this month I went back and her grave is marked on the stone along with her parents. I wanted to share these photos with those who use to read her blog. Let's remember Karen in our prayers this last week of November.